The electronics industry and ICT will play a key role as Finland seeks new growth and jobs. The Technology 13 event at Helsinki Exhibition & Convention Centre on 1-3 October 2013 will bring together technology professionals, boosting the quest for good practice and solutions. Technology 13 will provide a single forum for the principal technology sector events, incorporating the Automation, Elkom, Hydraulics & Pneumatics, and MecaTec trade fairs. The event offers a splendid meeting point, with networking opportunities, an abundance of free admission seminars, a high standard programme, and access to hundreds of industry businesses. Over 18,000 visitors attended the last corresponding event held at Helsinki Exhibition & Convention Centre in 2011. The Finnish Society of Electronics Engineers (EIS) will arrange a three-day ECT Forum where top business leaders will consider the importance of ICT and electronics as engines of growth. Leading industry policymakers will be invited to speak at a public forum. The keynote speakers for the Tuesday session will be Solidium Chairman Pekka Ala-Pietilä and Nokia Design EVP and Leadership Team member Marko Ahtisaari. The Wednesday session in turn will be addressed by Mikko Terho of Huawei and Mika Vehviläinen from Cargotec. “We are living in an era of industrial upheaval. Electronics and information technology are providing new energy for growth, with visible impacts for such fields as entrepreneurship and engineering. All sectors are benefiting from ICT. What matters is how smoothly new technologies are introduced and old practices are discontinued,” says ECT Forum planning group chairman, professor Tatu Koljonen of the Technical Research Center of Finland (VTT). Pekka Ala-Pietilä, Chairman of the ICT 2015 working group, will describe the proposals set out in its report “21 Paths to a Friction-free Finland”. Appointed by the Finnish Ministry of Employment and the Economy to consider the future of the digital economy, this working group envisages Finland recapturing its former status at the forefront of digital services. Marko Ahtisaari will discuss the importance of design in practical experience. The programme sessions on new technology will cover the latest wireless concepts and new electronic applications such as carbon nanotubes. There will also be sessions on growth enterprise, applying ICT and electronics in the engineering industry, and cybersecurity. In association with regional stakeholders, the Design Road Show has been touring Finland under an initiative co-ordinated by Design Forum Finland and the Finnish Design Business Association (FDBA) and backed by the Ministry of Employment and the Economy and the Finnish Funding Agency for Technology and Innovation (Tekes). Events have been arranged since 2008 in Helsinki, Turku, Tampere, Rovaniemi, Kuopio, Jyväskylä, Vaasa and Oulu. A free admission Design Road Show session will now also be organised at the Exhibition & Convention Centre on Tuesday 1 October from 14.00 to 16.30. Whether you are formulating ideas for R&D, trying to improve service processes or seeking assistance in reforming your corporate image or brand management, come and hear how your business can harness the power of design. The seminar will give industrial design firms an opportunity to present their work, and enable specialists to explain the latest developments in the world of design. After the speeches there will also be an opportunity to meet design firm representatives. The hunt is on again for Finland’s most marketing-minded engineer after this award was successfully launched last year. We are targeting creative and bold solutions for improving national competitiveness and new ways of combining engineering and marketing expertise. The winner will receive a prize of EUR 10,000 donated by the Technology Industries of Finland Centennial Foundation. The competition is organised by the Finnish Association of Marketing Communication Agencies (MTL). Candidates may be nominated or enrol directly, and the competition is open to everyone entering between 17 June and 3 September 2013. Success in the competition will be based on strong evidence of commercial acumen. The winning contestant will be announced at an award ceremony held during the Second wave seminar at Helsinki Exhibition & Convention Centre on 1 October 2013. Speakers at this seminar will include the distinguished neuroscientist adjunct professor Marja-Liisa Halko (Aalto University), award-winning author Sofi Oksanen, and leading IT Management specialist Stephen Prentice (VP, Gartner Group). The Wärkkäyskisa building competition for students will continue throughout the last day of the trade fair on Wednesday 2 October. Competing teams will design and build a device to produce the best wow effect on the Arduino Uno platform. A Mystery Box will be provided at the competition venue, and contestants may bring one joker component of their own. Standard components (RCLs, LEDs, connecting leads, diodes, standard FETs, etc.) will be available on site. All teams acceptably participating in the competition will receive their own Arduino microcontrollers and a Mystery Box with sensors. Contestants must enrol by no later than 10 September 2013. There will be separate competition categories for students in further and higher education. The judges will distribute prizes for competition placing and general standard of performance. The prize fund will be donated by the Finnish Fair Foundation. The judging panel will be chaired by EIS Chairman Vesa Linja-Aho, and the other judges will be professor Yrjö Neuvo of Aalto University, professor Jussi Ryynänen of Aalto University,Jouko Junkkari MSc (Eng.) of iProtoXi Oy, Esa Häkkinen Lic.Eng. of EIS, Jani OllikainenD.Eng. of Nokia Corporation, and Development Manager Jussi Kivikari of the Finnish Fair Corporation. Executive Director Jouko Mäkinen of EIS will serve as secretary to the judging panel. Can social media provide solutions to product and process R&D problems? What do the social media mean to industry? The smart machines cluster and social media in industry network is arranging a seminar on digital design and manufacturing from 09.30 to 11.30 on Wednesday 2 October. This event will discuss the latest industry developments and examine some examples of the solutions provided by social media to challenges that have emerged. Come and discover how you can get involved in collaboration, explain your R&D requirements, and arrange new partnerships. Facebook was launched in 2004, Twitter came online in 2006 and the iPad was released in 2010. These innovations have all revolutionised our world. What will happen in 2020? What product or service release will modify our daily lives once again? While we cannot promise to let you in on the Next Big Thing, we can try to take a peek around the next corner. ‘Welcome to 2020’ is the theme of an event at which top speakers will share with the audience the challenge of envisaging the future character of their industries. As part of its 2012–2018 programme Liideri – Business, Productivity and Joy at Work, Tekes will organise a seminar at Helsinki Exhibition & Convention Centre on Wednesday 2 October. This programme seeks to help businesses modernise their operations by enhancing leadership, working methods and workforce skills, with a view to giving Finland the best workplaces in Europe by the year 2020. Speakers at this event will include Jari Porras, Helena Åhman, Kiti Müller, Kaija Pöysti and Jorma Vartia. Another Tekes event will present the findings of research conducted under the Ubicom – Embedded ICT programme. A session on Thursday 3 October will discuss R&D projects on embedded IT that were financed through the Ubicom programme and conducted at various universities, research institutes and businesses. The project findings may be applied extensively in several applications and in various industries. A select range of project presentations at the public seminar will review the findings of universities and research institutes, together with their practical potential. 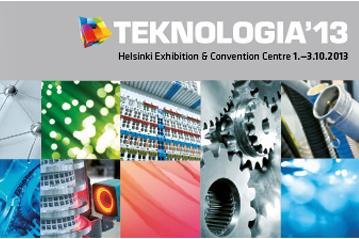 Technology 13 at Helsinki Exhibition & Convention Centre, 1-3 October 2013. Open on Tue-Wed from 09.00 to 17.00 and on Thu from 09.00 to 16.00.